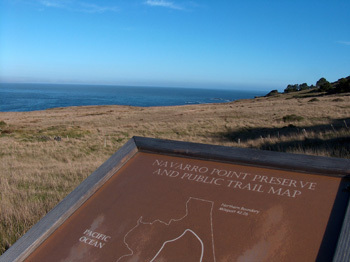 This 55-acre piece of ocean bluff is owned and managed by the Mendocino Land Trust at Navarro Point for botanical resources and public access. There is a short trail and sweeping views of the ocean here. A great place for a picnic. Like all spots along the coast, be prepared for wind. This roadside spot is no exception. Be sure to layer and bring a windbreaker. Stay back from the cliffs and obey the signs: this is a nature preserve. A small parking lot is visible right next to Highway 1, just before you drive down the hill to the beginning of Highway 128. Or if coming from Highway 128, it’s on your left right after you come up the hill. Even if you don’t intend to hike, just pull off into the parking lot inhale you first breaths of pure coastal air as you head north to Mendocino or Fort Bragg. Or, if you leaving the coast, Navarro Point is one last chance to look out to sea before plunging into Navarro Redwoods and heading home. The Land Trust has directly protected or facilitated the conservation of 9,377 acres of Mendocino County–an impressive achievement.